The XiVO Centralized User Management (XCU) is intended for multi-Xivo systems with centralized routing and user management. Using XCU for other use-cases than the one described bellow is neither supported nor recommended. If XCU routing schema or centralized user management does not fit your use case, XCU is not good solution for your telephony system. Using XCU for user management only is not recommended. Non-standard installations may be broken by update to future version without warning. Route incoming and outgoing calls, independently of the entry point to the target telephony subsystem hosting this number. Simple configuration of dialplan richness (prefix, short numbers, numbers of different length, emergency calls, live destination modification). Easily configurable protection against routing loops. 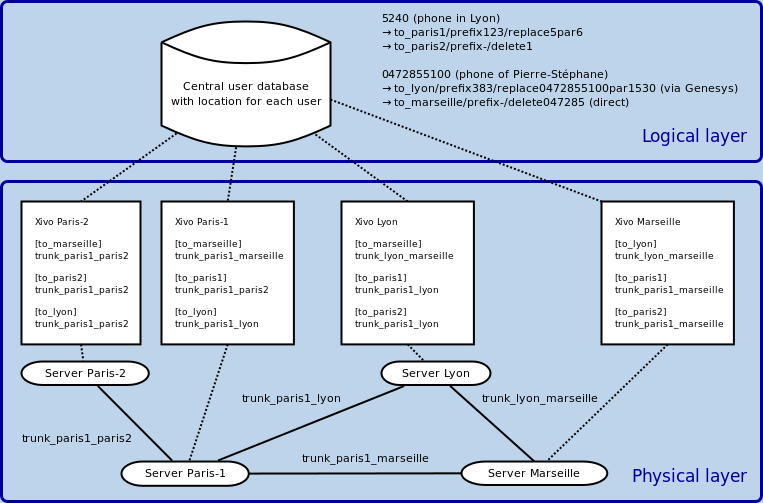 “Logical” layer - based on contexts, users are routed using centralized database returning the context to be used to reach the user, with extensions correctly routed irrespective to point of entry of call. “Physical” layer - arbitrary connection (direct or indirect) via trunks is supported. Trunks are associated to contexts to reflect the real network topology, there’s no need of full-mesh topology, a call can pass by multiple Xivos before reaching the user. Mapping between “Logical” and “Physical” layer is done by routing contexts. Every Xivo has routing context for every other Xivo (attached to trunk it will use). Routing context with the same name on different Xivo will be configured accordingly to the position of the Xivo in the network. Intervals can overlap between Xivos, therefore logical structure of dialplan can be independent on physical location of users. See Configuration of Xivos for Centralized Routing for more configuration details. A context used to process the call. Rules to update the destination number. Routing systems provides also the conversion of the direct incoming number to the user’s short number, this conversion is done when the call enters the system, between Xivos only the short number is used. This condition needs to be respected when creating a new system or integrating an existing one. When integrating an existing one, you may need to create some routes manually. Local calls work, even when other network links and/or centralized user database are unreachable. Routing server can be setup in High Availability master-slave mode. When master routing server is down, routing requests are automatically processed by the slave. Configuration is done from point of view of organization administrator, not telephony technician. User creation is simplified by line templates. Only relevant choices and options are presented. Extension number for new user is checked to be unique among all Xivos. Numbers proposed when creating a user are based on their availability, the number not used since the longest time will be reassigned first. XCU accounts can be restricted to manage only part of the system. All configuration changes are logged for auditability. Users added by Xivo WebUI before adding Xivo to XCU are imported, but they not reachable by centralized routing. Combining user management by XCU and by Xivo WebUI is bad idea, which usually leads to misconfiguration. Managing users by XCU and call-center configuration (Queues, Agents) via Xivo WebUI is possible, but queue numbers are not reachable by centralized routing automatically, you need to add manual routes if needed. Configuring conference rooms via Xivo WebUI is possible, but conference room numbers are not reachable by centralized routing automatically, you need to add manual routes if needed. When adding a freshly installed XiVO, you need to pass the XiVO Wizard and then follow steps described in Create XiVO. Existing users will be imported in the centralized management, but currently the system doesn’t create any route and these users are not reachable automatically, you need to add manually required routes. Existing internal contexts are converted to Entities and created in the management system. Ensure to have considered the interval overlapping option described in the Configuration.